Passed away peacefully Thursday 4th of April 2019. Wife to David Cordon Lund (dec). 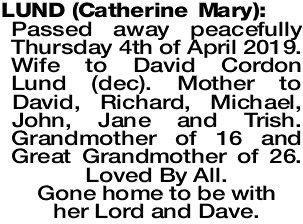 Mother to David, Richard, Michael, John, Jane and Trish. Grandmother of 16 and Great Grandmother of 26. Loved By All. Gone home to be with her Lord and Dave. The Funeral Service for Mrs Catherine Mary Lund will take place in Bowra & O'Dea's Chapel, 2 Leslie Street, MANDURAH commencing at 10:30am THURSDAY (11.04.2019). Cremation will take place privately at a later time.